Nicole's Needlework: In the Beginning Finished! 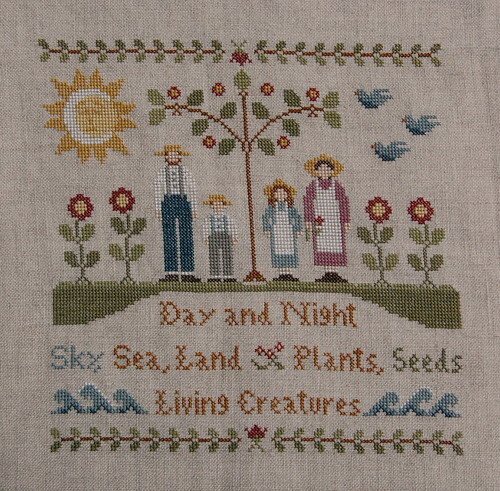 Little House Needleworks "In The Beginning"
I had one mistake - the top border is two stitches too close to the rest of the design. I don't know how that happened. I contemplated taking it out, but then decided not to. I don't think it's that noticeable. 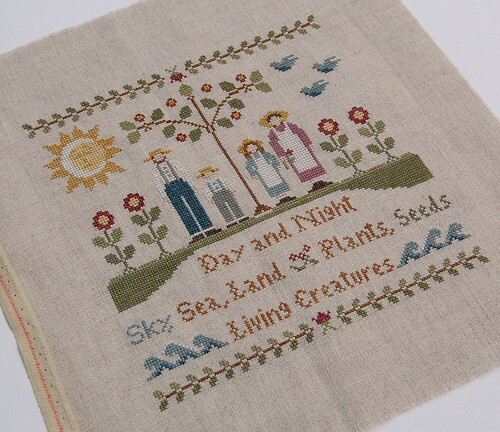 Today I think I'm going to work on my nephew's sampler. I'd like to get that finished too. Then I can get back my other samplers! Write later! You are really on a roll...two finishes in two days, congrats!!! They're both stunning!!! Don't worry. I think it looks great! Looks great. The mistake is not noticeable to me. By the way, you are an enabler. I had to go and buy Earth Sampler yesterday after I saw yours all finished and gorgeous! Just gorgeous! I can't tell the top border is closer than it was charted for -- it looks perfect! This is a great finish. And if you hadn't said anything about the border, I never would have known! beautiful!!!! your stitching is always so pretty!!!!! Great job!!! This looks lovely Nicole! Congrats on the finish. Very pretty, and no one will ever notice the border. I haven't listened to a book on my MP3 player yet, but it's my most appreciated companion when I walk my miles. Your two latest finishes are lovely Nicole. Great nephew photo - he's so cute! Fun finish Nicole! And you finished Twilight just in time for the movie to come out on DVD...at midnight tonight! Have a great weekend! Another great finish. I wouldn't of noticed any mistake but I don't think it makes any difference, it is a lovely piece. I would not worry about taking it out because it looks fantastic! I think it looks just lovely and I don't think you need to go to that trouble of taking it out! Awesome finish! What a beautiful finish and you did not make a mistake - you just personalised it lol. Your finish from the last post is lovely too. Wonderful, Nicole! I especially like the sun/moon! :) I think only you notice the mistake--I'd leave it in & call it good! Great finish. You certainly don't notice the mistake. No mistake noticed here, Nicole. What a delicate beauty this is, congrats on the finish! Simply beautiful, Nicole. Enjoy you weekend! Woo Hoo your needle is really smokin'. Congrats on another lovely finish. This is a great finsih! I wouldn't have even known there was a mistake if you hadn't mentioned it. I think that I will definitely have to purchase this design. It's beautiful, Nicole. Congratulations on your finish! Another beautiful stitching! You are really on a roll. Contrats!! It looks really lovely and I so like the sun with it's little face. :) I wouldn't worry about the mistake, Nicole. If you hadn't said anything I wouldn't have noticed. Most of the top area of the design is further away from the border so it's no biggie. Another wonderful finish!!!! Love it!!!!! When I saw your finish, this pattern flew right into my wish list :) Sun is adorable!!!! Very pretty finish! I wouldn't have noticed the mistake if you hadn't pointed it out :-). Congratulations on your latest finish! Woot, you are on a roll! Wow this is just totally beautiful and I am really glad that I got this one in my stash! You make me want to start on it! I am going over to my LNS today and might look for some fabric for it after seeing yours! I wouldn't take anything out! It is awesome!!! I have been stitching on my QV. Mistake, what mistake ? It looks wonderful ! Nicole, In the beginning is lovely. Congrats on the finish. great finish! I listened to the whole Twilight series on my MP3 player and I loved them all.